I know I will feel guilty if I don’t share this great condiment/ sauces shop with you for getting good Chinese New Year dry food goodness. 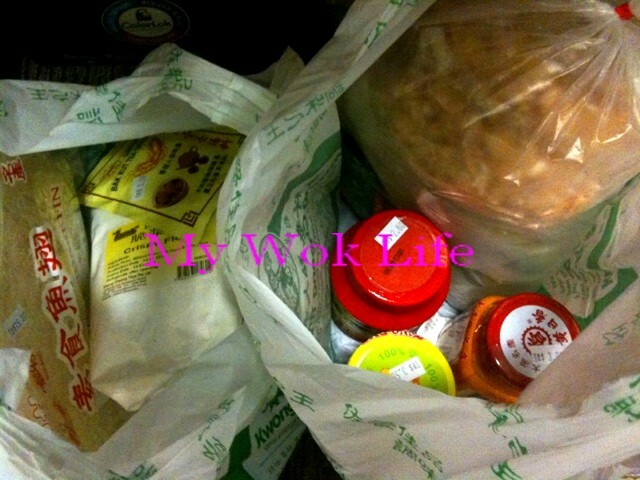 This shop was recommended and I was brought there by one of my colleagues recently, great for getting CNY food stuff. One of the most popular CNY goodies there has to be the pre-packed Yu Sheng ingredients, of course! I couldn’t wait to try it after getting the first packet of this pre-packed Yu Sheng ingredients. So, we had our very first Lo-Hei last Sunday. It was indeed scrumptious. The crunched crackers that tops to the Yu Sheng, was extensively crunchy and aromatic! Thus, I went back to the shop again to get more Yu Sheng packs and bottled sauces as well as some other dry goods for usual cooking use, too. Coming back to their Yu Sheng ingredients… These are sold in various forms. They offer pre-pack, gift pack, and even individual pack in small and large quantities. What we have gotten are those pre-pack ones serving easily 10 – 12 person. Cost: S$17.90. This is the prepackage and it considers a value-pack as the portion in each pack is so generous that surely enough for more than 10pax. If you like the super-crunched crackers a lot, go for this Yu Sheng pack as they offer 3 packets of crackers in each pack. If you have already gotten your own Yu Sheng ingredients, consider getting the Yu Sheng sauce in bottle which costs $3/bottle. 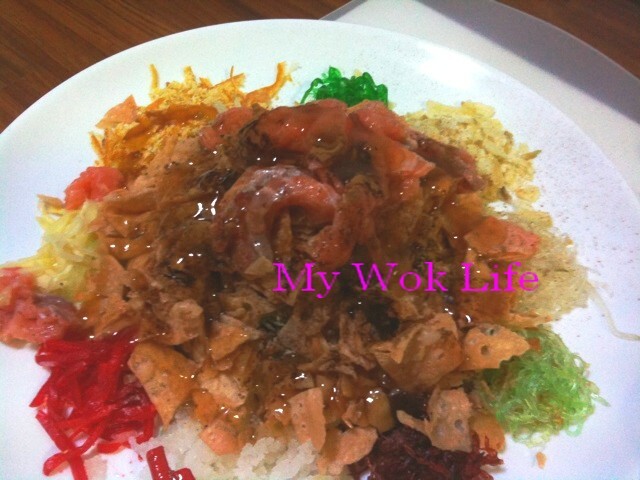 Its pleasant sweet and zesty flavour is the main key to elevating the taste of the Yu Sheng dish. This shop is selling more than just the Yu Sheng ingredients, but many different kinds of condiments, prepackaged sauces, dry food stuff and the ingredients for Vietnamese food, Japanese food, as well as all kinds of frozen/ ready made vegetarian food. Even frozen red bean pancake and yam ring are found here! Tips: 3 minutes walk from Aljunied MRT station. Turn left from the MRT exit gantry. The shop is located in the middle of the stretch of shops, two rows away from the MRT station. * Prepare your own pomelo sac to top onto the shredded carrot, white and green radishes. * Add also 1 – 2 tablespoons of peanut oil to moisten the Yu Sheng dish. * Top with raw Salmon fish slices. Sprinkle some five-spice powder and drizzle freshly squeeze lime juice onto the fish slices before topping. How much carrot, white and green radishes did you shred for the Lo Hei? Any tips for shredding these vegetables or its just normal way of shredding just like we use them for normal cooking. For serving of 10 – 12 person, aka, one package of the yu sheng pack, you will need just 1 carrot, 1 small white radish and 1 small green radish (*small radish = similar size of a carrot). The radishes might be thicker than a carrot though. It’s ok, adjust amount when arranging on the serving dish. Each should be about the amount of a Chinese rice bowl. And, remember to squeeze & drain out the juice of the shredded root vegetables. 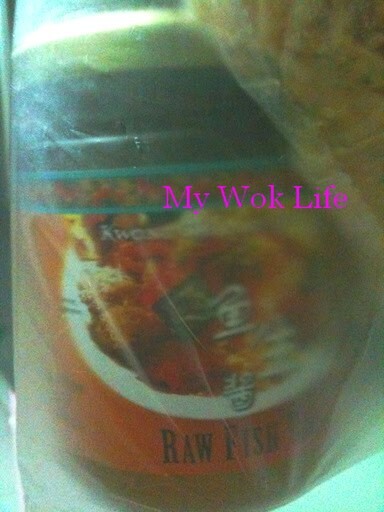 Otherwise, the Yu Sheng dish will be ‘flooded’ with carrot/radish juices when eating it. 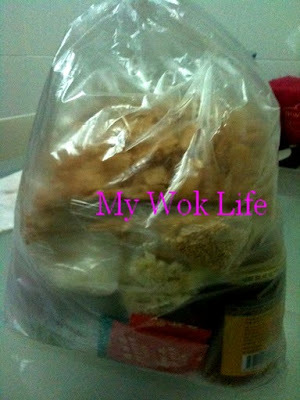 I may not be able to buy yu sheng pack from Kwong Cheong Thye….will probably try those sold at NTUC. May the Year of Rabbit brings Good Health, Happiness & Prosperity to you and your family!!! Oh.. It’s ok.. NTUC sells pretty good selections of Yu Sheng packs, too. The yu sheng at NTUC is also packed and bought from kwong cheong thye. kwong cheong thye supplies NTUC with the prepacked yusheng and NTUC sells it to the public as they have a larger support base. Wish you and your family a Happy Lunar New Year, Gong Xi Fa Cai! I am Dorcas, just want to inquire. Is the yusheng ingredients in this shop available even after the cny period? How do prepare the root vegetable for the Loh Hei to be crunchy? This is my first time preparing it for the office gathering so my Malay friends can also enjoy a halal Loh Hei. Hi Siti, very simple… Simple finely shred the root vegetables. Then put the shredded veg in a large clean cloth, wrap up and squeeze out the juice. But note that the finely shredded might not be in shape after squeezing. So, do not put too much force to squeeze dry. Anyway, no need to be super dry. Just squeeze out some juice will do.. If it is not to be used immediately, keep in the air tight container and use the shredded veg within 3 days. Thank you for the advised.My Malay Loh is a success.My colleague like it.I also add mango,papaya,raw fish,abalone and green apples as suggested by my chinese friend. Hi Siti, glad to hear that. Mango and papaya may not be necessary as it might turn out tasting like Thai salad. :) however, I would suggest shredded china pear if you do not want shredded root vegs. I did not go there this year. You may call them to check out. Try NTUC Fairprice, too. Does this Yu Sheng pack includes the vegetables (carrots,raddish,ginger…) just need to TOP up the pomelo only? No, the Yu Sheng pack will includes only the preserved and dried ingredients. Fresh ingredients eg shredded carrots and pomelo have to be purchased and added separately. I know NTUC Fairprice and some Cold Storage supermarkets sell the prepacked shredded carrot and radish.